I heard an interview yesterday on NPR with Stewart Brand, the creator of the Whole Earth Catalog and an icon of the environmental movement. He's now taking a stand on returning back to big cities, supporting nuclear power and encouraging genetic engineering as a way of reclaiming our planet and solving the global warming issue -- and he made a lot of sense. 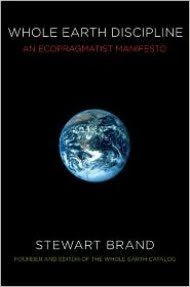 From the Huffington Post: "In these pages, Stewart Brand lays out a mind-blowing vision for the planet's salvation: migration to the cities, power generated by mini-nuclear reactors, healthier crops through genetic engineering. This may well be the most important book I'll read this year. Certainly, it's the most aggressively optimistic book that's also closely reported. To read the full story click here. An expert from the Amazon review says "Whole Earth Discipline shatters a number of myths and presents counterintuitive observations on why cities are actually greener than countryside, how nuclear power is the future of energy, and why genetic engineering is the key to crop and land management. One thing most pro-nuke and anti-nuke folks share in common is a lack of understanding of how the technology is used in the real world. It's not The Simpsons and it's not Star Trek. I've worked in US plants over 20 years and have written a novel aimed at the general reader that covers the people, politics and technology of this energy source. I look at both the good and the bad. See the homepage for reader comments - they seem to like it for both its story and information. I think there are many possibilities for our future, both with and without nuclear power, but I also believe we'll make better decisions about our energy future if we first understand our energy present.